Now available from Arrow Farmquip the V-Express sheep and goat handler is another example of the company's dedication providing handling solutions for the livestock industry. 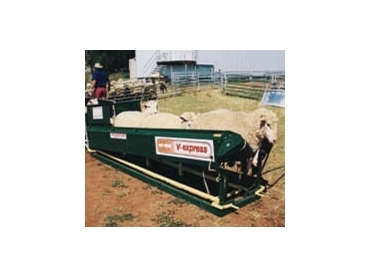 The V-Express is an advanced design in which the sheep approach the machine in a single-file race where they are picked up between a pair of moving belts arranged in a V-shaped profile so that the sheep are moved along with their feet off the ground, and its body restrained by its own weight between the V-profile belts. Sheep restrained in this way can be inverted easily by holding them under the neck as the machine moves them past the operator, achieving a gentle rolling action which ends with the sheep on its back. All Arrow Farmquip Cattle and Sheep Handling Equipment carry full Australian warranties for customer peace of mind.